1The red naked sides of the copper mountain, with clouds of smoke curling over dark pine woods, announce from afar theses celebrated mines. The immediate approach to the hamlet is like that to a minor infernal region: the road is made of burnt ashes and [slag] the […] walls are composed of lava-like dross, while haggard miners with sallow faces and darkened dress, creep about, fit denizens of the place. The green coppery stream which winds under the banks of fir is the tinged river, from whence the village takes its name: flowing out of the bowels of the mountain, it is supposed to be connected with some internal ancient conduit: the purest copper is obtained from it; iron bars are placed in wooden troughs, which are immersed in the waters; the cascara, or flake of metal, deposited on, it is knocked off; the bar is then subjected to the same process until completely eaten away. The water is deadly poisonous, and stains and corrodes everything that it touches. 2[…] The village is principally occupied by the miners; there is, however, a decent posada (inn); the empleados (members of the staff) and the official people have a street to themselves. The view from above the church is striking: the town lies below with its stream and orange groves; to the left rises the ragged copper hill, wrapt in sulphurous wreaths of smoke; while to the right the magnificent flat fir bank, which supplies fuel to the furnaces, la mesa de los pinos, is backed by a boundless extent of cistus-clad hills, rising one over another. 3A proper officer will conduct the traveller over the mine […] Entering the shaft, you soon descend by a well, or pozo, down a ladder to an under-gallery. The heat increases with the depth, as there is no ventilation; at the bottom the thermometer stands at 80° Fahr., and the miners, who drive iron wedges into the rock previously to blasting, work almost naked, and what few clothes they have on are perfectly drenched with perspiration; the scene is gloomy, the air close and poisonous, the twinkling flicker of the miners’ tapers blue and unearthy; here and there figures, with lamps at their breast, flit about like the tenants of the hall of Eblis, and disappear by ladders into the deeper depths. 4Source : Richard Ford, Handbook for Travellers in Spain…, pp. 216-217. CHASTAGNARET, Gérard. Río Tinto avant 1850 vu par un voyageur anglais In : De fumées et de sang : Pollution minière et massacre de masse. Andalousie - xixe siècle [en ligne]. Madrid : Casa de Velázquez, 2017 (généré le 18 avril 2019). Disponible sur Internet : <http://books.openedition.org/cvz/3776>. ISBN : 9788490960929. Chastagnaret, Gérard. “Río Tinto avant 1850 vu par un voyageur anglais”. 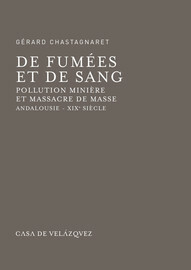 De fumées et de sang : Pollution minière et massacre de masse. Andalousie - xixe siècle. By Chastagnaret. Madrid : Casa de Velázquez, 2017. (p. 351) Web. <http://books.openedition.org/cvz/3776>.